The main Grand Valley Trail is a marked footpath stretching about 275 km between Port Maitland (42.866035,-79.565699) [near Rock Point Provincial Park] on Lake Erie, south of Dunnville to the town of Alton (43.860379,-80.068796), near Orangeville. A hiker can identify the main Grand Valley Trail by the white blazes approximately 5 cm wide by 15 cm high. Guidebook ISBN: 0-9780437-0-7 The current GVTA Guidebook, 7th Edition, was first printed in April 2015. For more information about the main trail, blazing, side trails, connecting trails (e.g. 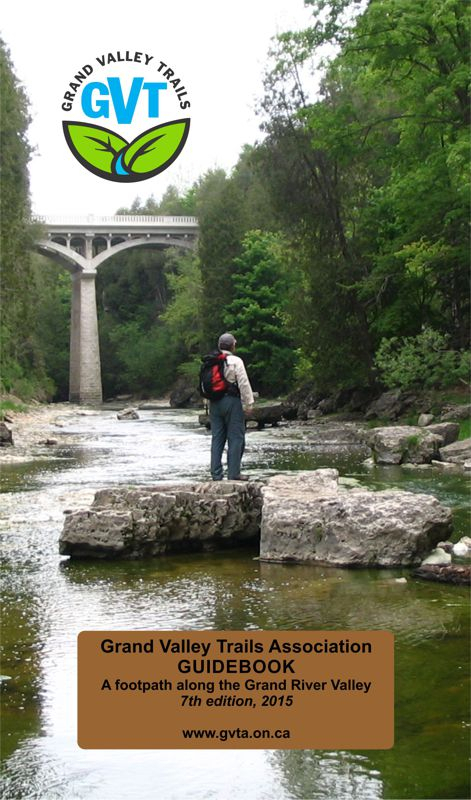 Avon and Bruce Trails), parking, camping and the trail user's code, we encourage you to purchase a copy of the GVTA Guidebook. Print a copy of the order form and mail it to us. Guidebook orders over 10 are eligible for a discount, please contact us for information. Please call ahead to ensure a copy is in stock. The profits from the sale of the Guidebook are used for the purchase of trail maintenance materials such as pressure treated lumber & used to build foot bridges, boardwalks, box culverts and so on. 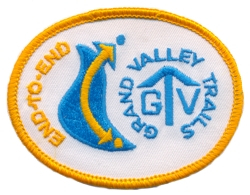 This chevron is issued to members who successfully complete the GVTA hike leader training. 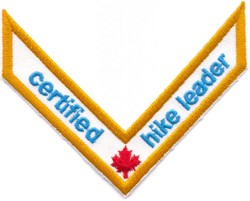 See Hike Leader Training for details. 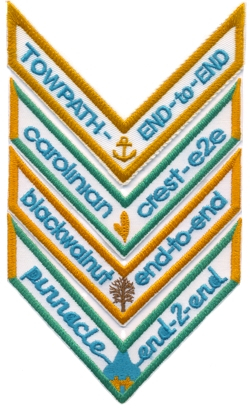 An end-to-end badge as well as section chevrons can be purchased by hikers who have completed the corresponding trail segments either through the Online Store or by mailing in an order form. Below is a description of trail segments and chervons. A log must be submitted and can be emailed to hikes@gvta.on.ca or a hard copy should be submitted with the order form. The Log needs to contain trail segment, km and/or from - to information with date hiked. Click on links below for blank logs that can be printed. GROUP ORDERS: If this for a group (for more than one person), only one log signed by the hike leader(s) is required and it should be accompanied by a listing the names of all the people who completed the hike series. Beside each name please print “GVTA” if that person is a current GVTA member. Chevron design and description by Bill Haartman. Lake Erie at Rockpoint Provincial Park to Haldimand-Onondaga Townline Road at LaFortune Conservation Area, 65.4 km. Haldimand-Onondaga Townline Road at LaFortune Conservation Area to Brant-Waterloo Road, 68.9 km. Brant-Waterloo Road to Middlebrook Pl (near steel bridge), 75.6 km. Middlebrook Pl (near steel bridge) to top of Pinnacle in village of Alton, 65.5 km. "A chevron is a heraldic device" says the Webster's dictionary. Therefore the colours and patterns used here have a meaning. The anchor refers to the Grand River navigation canal that was created here in the 1830's. It rapidly became the early " highway 401" of transportation for the settlers. Subsistence farming changed to cash crops. A gold rim reflects the wealth created. The block lettering hints at the canalized river. 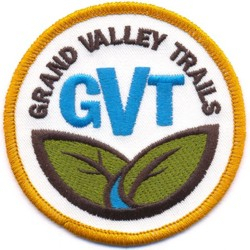 Blue and white are the colours of the GVTA which you will also find in others chevrons of this series. The most northern Carolinian trees can be found in Brant County. The Sassafras (Sassafras albidum) is one of those and known as the "mitten" tree for one of its mitten-like leaves. The Sassafrass, a very valuable tree, is a source for the production of root beer using its roots, tea and fragrances from its leaves and twigs, good lumber from its trunk and medicine from its bark. The green rim on the chevron represents the forest association known as Carolinian and the gold edge represents the great value of the Carolinian forest to this region. The rounded blue letters on white, points at a natural river. The pioneers followed the "Trail of the Black Walnut", a tree clearly standing out in the fall when leaves have been dropped and its fruit is clearly exposed . It indicated a deep, rich, moisture-holding soil, light enough to be easily penetrated by its taproot and hence easily tilled by the would-be farmer. The trunks of such trees have good lumber. It became the source of the well-known furniture industry of the region. A complex, rich conurbation arose here in this Waterloo region. A silhouette of the black walnut tree, gold rim and the standard blue and white grace this chevron. Headwaters area of the Grand River basin. Here water gathers in basins and through small, sometimes intermittent flowing streams gathers eventually in remarkable Lake Belwood. Remarkable because it was the first dam built in Canada solely for the purpose of conservation and it was built during World War II when most money was needed for the military. The connected letters simulate drainage . Some letters are "filled" to suggest ponding. All leads to the lake. The dam is in gold with a central spillway. Environmental green for the badge edging is used on this chevron.